So far so good. 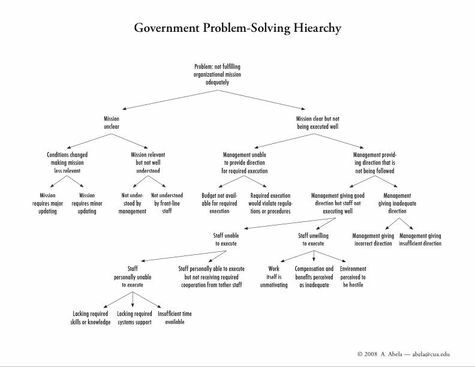 But one of the reviewers of the book manuscript has suggested that it would be good to provide similar hierarchies for non-business situations, namely government or other not-for-profit, and military. 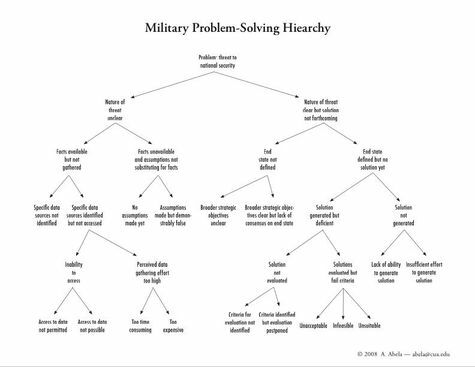 So here, with the help of friends in the Pentagon and the Federal Government, are preliminary drafts of Government/Not-for-profit and Military Problem-solving Hierarchies. (Click on each image to see a larger version; pdfs are at the bottom of this post). 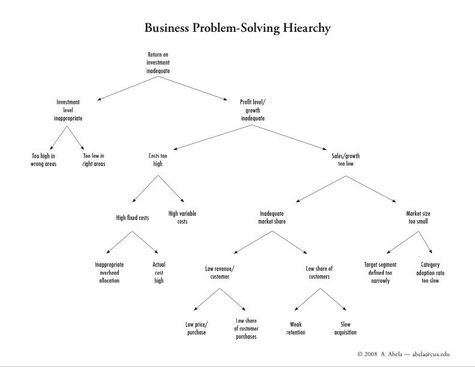 - Is this how you think about problem-solving? - Are the structure and terminology right? - What would you add, change, or delete? You can reply by commenting on this post, or by emailing me directly: a.v.abela(at)gmail.com.